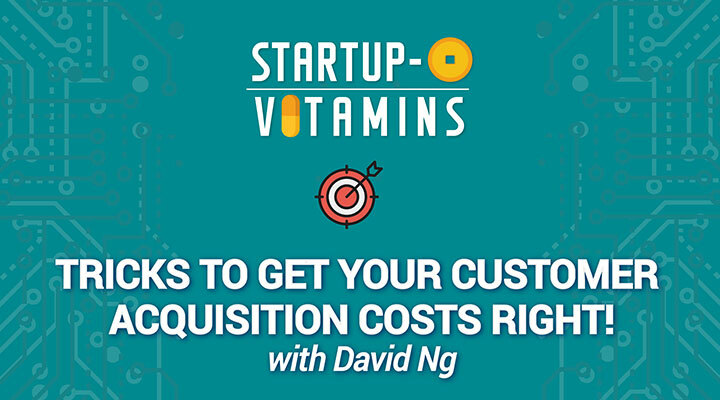 In the next video on Startup-O Vitamins series, we discuss with David Ng, Group CFO of MiRXES on how should a B2B SaaS startup calculate their customer acquisition costs . I think it’s important to identify which part of the life cycle a company’s at. Getting your first 3 to 5 clients is different from getting your 50th or 100th client. So I think understanding that your stage in the startup life cycle impacts your abilities and comfort with the whole go-to-market and marketing process in fundamental. I like to see teams have a full costed approach to looking at cost of acquisition. So, it’s not just the obvious stuff like the cost of advertising, search engine optimisation or conference cost, but it’s also looking at onboarding costs. While it’s easy to get a client, you’re often getting a client as a desperate startup because you just want to say yes to everything. The consequence of saying yes too early and too easily is that you may then have extra onboarding stuff to do. You could also have a lot of non-recurring engineering work to needs to be embed in. Whether it’s data or esoteric requests, I think that it’s quite common to have additional, unanticipated onboarding costs. For me, that’s somewhat tolerable with pioneering clients but the founding team needs to really understand what you wish to learn from that experience. You want to show that you learned from onboarding your first couple of clients. Depending on whether software or PaaS or SaaS, improving your onboarding or acquisition cost is something that you, as the founding team, want to show you’re aware of and you’re learning each time a new client comes onboard. So, I think, it is important to be honest with hidden costs and the time taken. A lot of investors like to, understandably and rightly, look at purchase life cycles. Government clients may take 6 months because you have to get through a number of process. Is it wise to target those clients versus targeting maybe, smaller clients who don’t have such a rigorous procurement requirement? Want to learn more about Fundraising, Growth Hacking, and other startup advice? Join our fast-growing Facebook Community here!